The project ‘a Blue Biotechnology Master for a Blue Career’ (BBMBC), which involves the CPMR’s Atlantic Arc Commission, gained high profile recognition during the 2017 EU Green Week as a noteworthy project to enhance the European blue economy. This year, the theme of ‘green jobs’ was chosen for this annual event organised by the European Commission. As part of the Green Week in Brussels, the CPMR’s Atlantic Arc Commission (AAC) too part in a meeting on ‘Skills needs in an evolving maritime green economy’. The workshop highlighted how the transition to a low-carbon economy is impacting on the workforce needs in the blue economy sector. 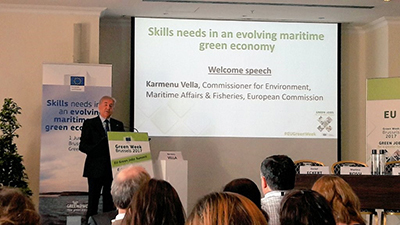 The European Commissioner for Maritime Affairs, Karmenu Vella, as well as other keynote speakers, mentioned the BBMBC project as an exemplary and innovative project to solve the skills gap in the maritime economy. The objective of the BBMBC project, which is led by the University of La Rochelle, is to gather universities and SMEs from the Atlantic area to build a curriculum of a Master’s degree in applied blue biotechnologies based on the private sector’s needs. It will start in September 2017, at the University of La Rochelle, and will support the entry of graduates into the labour market. The blue biotechnology sector is growing fast but suffers from an insufficient number of professionals equipped with the skills and competences for the workplace, as well as a lack of communication on the job opportunities available. It is not the only blue economy sector which faces this challenge. That is why the Atlantic Arc Commission is currently working to find opportunities for this project to be transferred to other geographical areas and blue sectors. This should contribute to supporting both industry and education to overcome skills gap to develop sustainable blue growth in the EU.